Straight Up, No Frills, Electric "Texas Fried, Chicago Funked Blues". All Killer, No Filler Debut CD for all Blues Fans and then some. 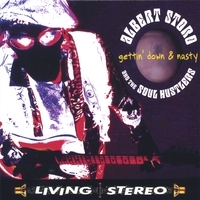 Killer Debut CD from Houston Based Bluesman "Albert Storo"
In this Day & Age where the most "popular" & solid releases are filled with lots of "Distortion & Wha Wha pedals" , Be assured, there are none here..
Flashy licks & guitar stunts are not needed for this man to stay true, focused, yet uncompromisingly up to date with his Blues, He clearly shines with a powerful Electric debut blues recording. From the opening track of the Jimmy Rogers classic "Thats Alright" you'll get the idea of Alberts vibe is all about, this reworking is drenched in the spirit of the Live early/mid 70s styling of the late "Freddie King". The Slow Blues Chicago, IL classic "All My Life" drips with guitar influences of "Otis Rush", this track not only features Albert on Guitar & Vocals but, on Drums & Bass as well... "I just needed to get the feel & most importantly, the arrangement right" Storo says. The 14 plus minute version (only live track)of "Bobby Rush'" "Chicken Heads" shows how you can still push the envelope without playing stereotypical "Blues Rock", its "Rocked Up Blues" thats all. The Self penned "Lovin You" is reminiscent of the Bump & Grind style of say "ZZ Hill" or "Little Milton"& a guitar solo that pays sincere homage to Storos former boss, bluesman "Bobby Parker". The closing track "My Favorite Things" is rearranged in a completely new & refreshing take on the Classic Jazz standard again, without making it a 'Jazz tune" per se' yet still, keeping 100% respectful and organic. Former "Professor Longhair" attorney & CEO of "Master Digital" in Covington, La had nothing but praises for the CD as a whole, and is quoted as saying, "Its a solid CD with strong performances, and regarding "My Favorite Things" Coltrane would've approved, you should have no problem selling this product to the masses"
For every Electric Blues fan, this is not just a one time listening disc, this Debut CD captures a great slice of what "Albert Storo" is all about, and every Blues fan will definitely find something here to enjoy over & over again.